Fall Fashionista Events Lookbook Giveaway! Welcome to the Fall Fashionista Events Lookbook and Lookbook Giveaway! In this Lookbook, you will get a SNEAK PEEK at all the prizes that are being sponsored by all 108 blogs for this year’s Fashionista Event, hosted by Still Blonde after all these Years and Modly Chic. The event is co-hosted by K Squared Glamour. Crumb Drains™ … bye-bye mess! 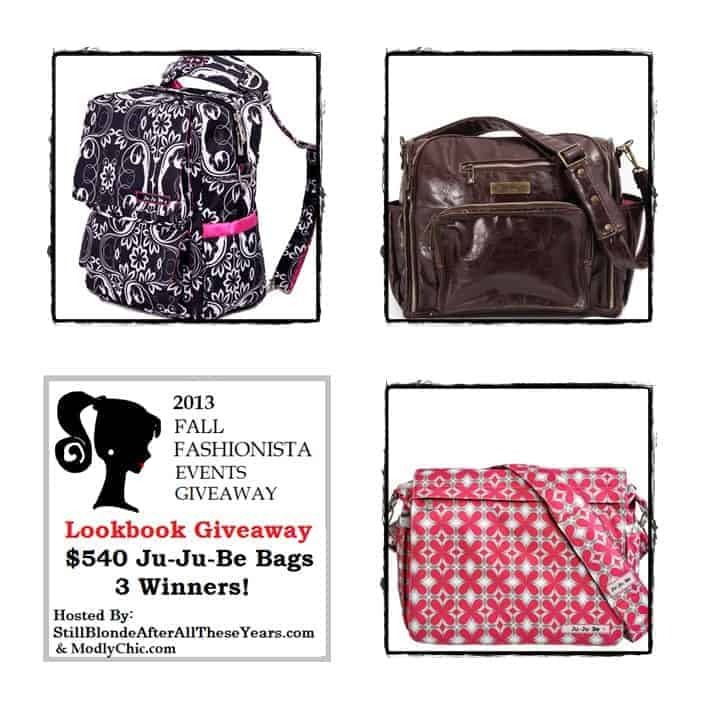 The Fall Fashionista Lookbook features many of the sponsors for the Main Event and for individual blogs. Our Main Event Prizes total $1000. Coupons.com is sponsoring $300 of our Main Event Prize. They want you to know that in addition to their amazing coupons, they also have coupon codes to use when shopping online. More sponsors will be added everyday, so be sure to check back and make a list of your favorite products and bloggers. You will then be ready for the Fall Fashionista Events Giveaway which takes place Oct. 3-9. Take the day off work and don’t miss this event! I like the Be Prepared bag because it is just that….being prepared for just about anything! It would hold any thing necessary for a trip to the store or a trip overnight. The Better Be is the best option for me. I like the long strap, it can be worn as a crossover bag so my hands are free. And there is lots of room for all the STUFF I have to have with me at all times. I like the Better Be bag the best. The shoulder strap is helpful and I love it’s large size. I really like several, but the best bag to serve me would be the Better Be bag. I am currently toting food around for several elderly family members. A three hour drive one way…this bag with the thinsulate would help me so much in keeping food cold and safe and much easier then my current Styrofoam cooler. Thanks. I like the Be Prepared bag. It has a lot of pockets and space to fit all the things you need. I love this bags. I like the Better Be bag, but if I were going on a trip I’d like to have Pack-a-Be bag. I like the Giga Be Earth Leather Laptop Large. It is perfect for carrying a laptop and everything else I might need to take with me. I like the Better Be! I like the Be Fabulous bag with the hot pink lining. I just love the way it looks. Looks very classy. I really love the Be Fabulous leather bag. It’s sophisticated & attractive so it’s why I would love it. I’d like to get the B.F.F. licorice swirl for my niece. I like the Be Prepared bag because it fits my lifestyle right now. Love the Be Prepared Bag– I’m sure it will help me to stay organized! I love the behave bag! It’s great looking, nothing like other diaper bags and has tons of storage and pockets! the be prepared bag is right up my alley as I’m a girl that likes to be prepared!! I like the be prepared bag because you have thought of most everything, like teflon coating, and it is washable. Also the pockets are very neat! i like the BFF in the Licorice Swirl design. i love all the pockets and the detachable shoulder strap. BE PREPARED EARTH LEATHER would be great. I would not be using as diaper bag. Just travel. I like the Be Prepared, because it is pretty & can hold both of my kids’ items. The be prepared would be the best bag for me. I like to bring everything with me just in case and this bag looks big enough for me to stuff all my kids stuff and my junk in it. The Be Right Back bag is great. I always used totes when my daughter was little and found that sometimes that just didn’t work. Now that she’s older and we run around at playgrounds, the backpack style would be much easier. My favorite is the B.F.F. It looks like it will hold so many things and as I am disabled I am always looking for something like this! I like the Be Fabulous in brown because it’s such a cute diaper bag! I’m expecting my first baby in January and really don’t want to carry something ugly. The mighty be, I love the look! I love the backpacks! They are the best! I would chose this one http://shop.ju-ju-be.com/Be-Prepared-Earth-Leather-PID11823-11MB01A.aspx and Why – because I love black leather it would match all my stuff. I like the behave bag! I love the Be Fabulous bag because it’s so stylish and doesn’t look like a diaper bag. And, I love the lining that’s bright. I like the behave bag because it is super sassy. I love the HoboBe in the scarlet petals pattern. I just love the look of these and how functional it is at the same time! Would love one! The be prepared would be perfect for or 3 kids under 5. And the plAtinum roses wold be perfect for mommy’s style. I love the Better Be, it is perfect for me because one of my closest friends is pregnant and she needs an awesome baby gift. This bag is just the right size for a mom on the go and comes in patterns she would love. I like the Be Right Back, it would be great to have when going into the city and have to lug around stuff. The HoboBe bag would be perfect for me. I like that when they grow out of diapers you can use it as a cute purse. It is big enough to carry snacks, extra undies, and their drinks when their older. My favorite print is the Mister Gray.